AWARD WINNING AUTHOR’S PRO SE SINGLE SHOT SIGNATURE SERIES DEBUTS-BYZANTIUM! Pro Se Productions, a cutting edge Genre Fiction publisher announces the latest series in its PRO SE SINGLE SHOTS line. Award Winning Author I. A. Watson, one of the most prolific voices in New Pulp, takes readers into a world of history of fantasy, one marred with magic, monsters, and mystery in his exclusive original Pro Se Single Shot Signatures Series Byzantium. 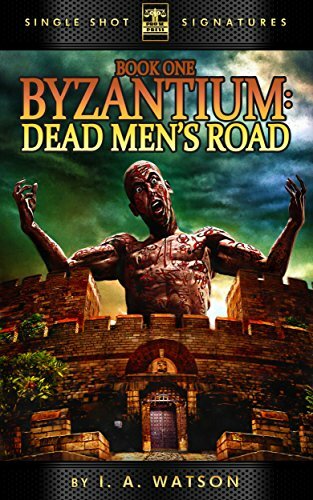 In Byzantium Book One: Dead Men’s Road, a beautiful woman tasked with delivering a sealed package to the Invisible College in Byzantium is pursued by merciless bandits, relentless undead, and a charming scoundrel who has nothing to lose. Cover Art and Design by Jeffrey Hayes and Digital Design by Russ Anderson. This first issues of Watson’s Byzantium is now available for download for 99 cents at Amazon, Smashwords, Barnes & Noble, and www.prose-press.com. PSYCHEDELIC PULP AUTHOR’S PRO SE SINGLE SHOT SIGNATURE SERIES DEBUTS-THE FABULOUS WORLD OF ZENITH BY CHUCK MILLER BEGINS!